U.N. General Assembly Declares "Decade of Action for Road Safety"
Traffic in cities like Bangalore can be deadly. Photo by Roy Sinai. The U.N. General Assembly proclaimed on Tuesday that 2011-2020 will be the “Decade of Action for Road Safety,” recognizing the “tremendous global burden” of fatalities and injuries resulting from road crashes each year. Road traffic crashes kill 1.2 million people and injure up to 50 million each year, according to the World Health Organization. The World Bank says that if nothing is done to make roads safer, road traffic crashes could become the fourth or fifth leading cause of death in low- and middle-income countries by 2030. Part of the problem is the explosive growth in the number of vehicles — from cars to motorcycles — exacerbated by high speeds and a lack of regulation. Children are the most at risk. The U.N. General Assembly is calling on the WHO, the U.N. Road Safety Collaboration and other stakeholders to prepare a “plan of action” for the decade. It is also encouraging Member States to plan their own road traffic casualty-reduction targets. 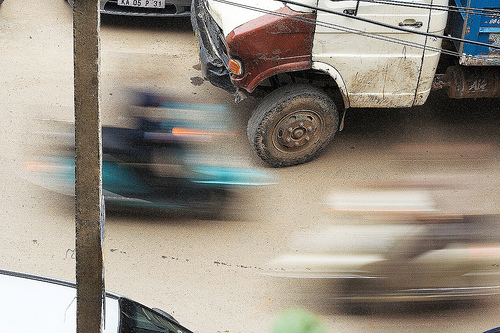 EMBARQ, the producer of this blog, recently received a grant from Bloomberg Philanthropies to implement programs in low- and middle-income countries to prevent death and disability from road traffic crashes. You can read more about its work here.